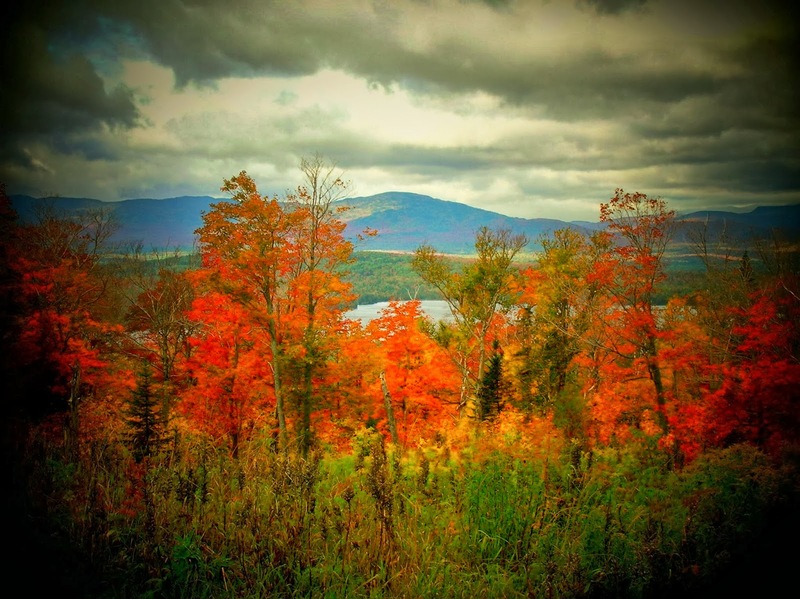 Jeanette and I just spent a week in the mountains of western Maine. The weather could have been a bit better. From the time we left New Hampshire's White mountains and into Maine the skies were socked in with clouds, and with clouds you will have showers. That weather seemed to hang on for most of the week, with a few exceptions where the sun made a brief peek. It was funny that you would be in cloudy weather on the stream, and walk upstream and find the sun poking through. The temps were in the high thirties at night and would warm to the mid forties in the day. The fall colors were in peak but were muted by the gray skies but their beauty was awesome. Autumn fishing is so dependent on good rain. These rains raise the stream levels and flows, this allows the fish to move up from the lakes to spawn. Unfortunately this did not take place and those giants were no where to found. 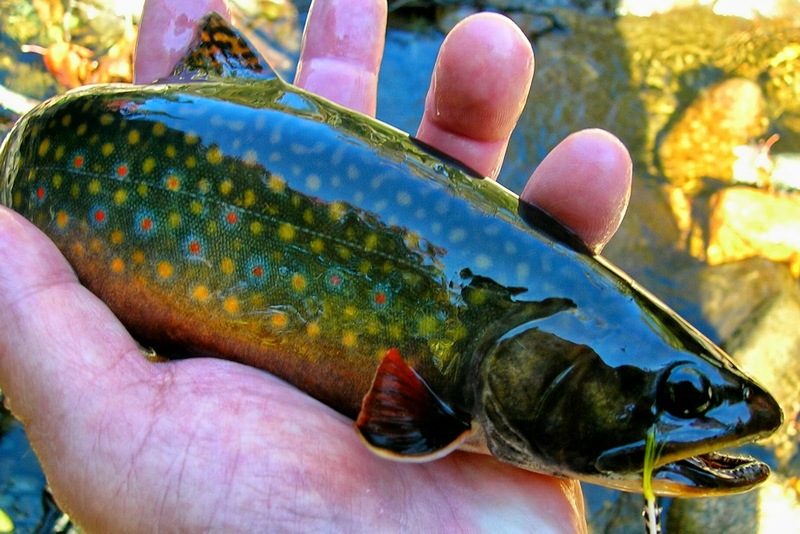 But a small stream guy can find willing wild brookies if he walks the woods and finds a stream. The first three photos were taken on a 3,000 ft peak. They show an incredible wilderness full of lakes, and endless streams, not to mention moose, deer, bear, and a enormous amount of wild turkey. Among the sweet smelling balsam and birch flows a stream. This stream runs cold and clear for the year except for winters blanket of ice and snow. The stream holds wild brook trout who at this time are doing what they have done since the last ice age. It was wonderful drifting various flies and having a strike on almost every drift. So many were lost, but a few graced this anglers hand. The deer seemed to be totally unafraid of my being there in their kitchen. I was given time to photograph them and go on my way. This stream was incredible. I would fish a run and hook a few on a Bomber, change to a Adams parachute, and take a few more in the same run. In the land of the streamer the number one fly on this Maine trip was the Adams parachute. 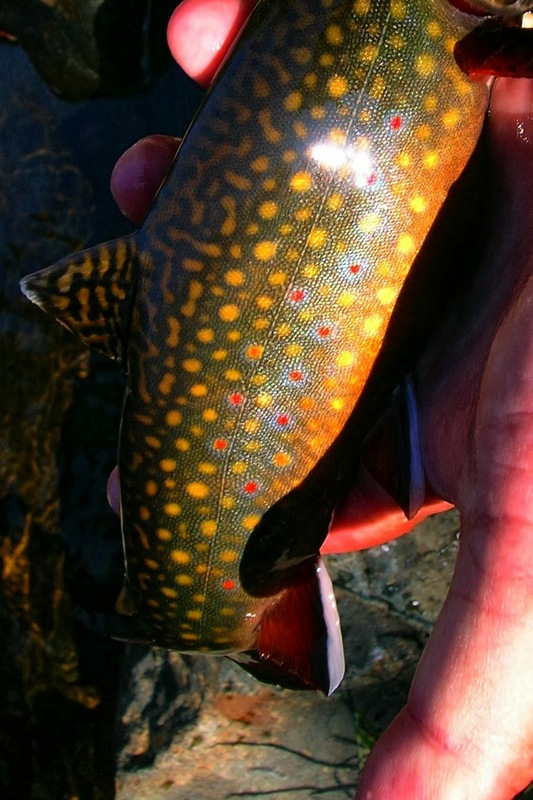 A precious wild brook trout in fall dress. A true beauty in this wild place. This was a typical sunset. Clouds and just a hint of the sun. A real plus this trip was a gas station that featured Green Mountain coffee. They also had a supply of the Maine classic whoopie pie. Several of these made there way back to Connecticut. We just got home from a week of wonderful brook trout fishing in Maine. I have lots of photos and reports. I also have many blog post to read. Hopefully I can post my first report tomorrow. Over the next week Jeanette and I will be spending time in the woods and waters of northern New England. 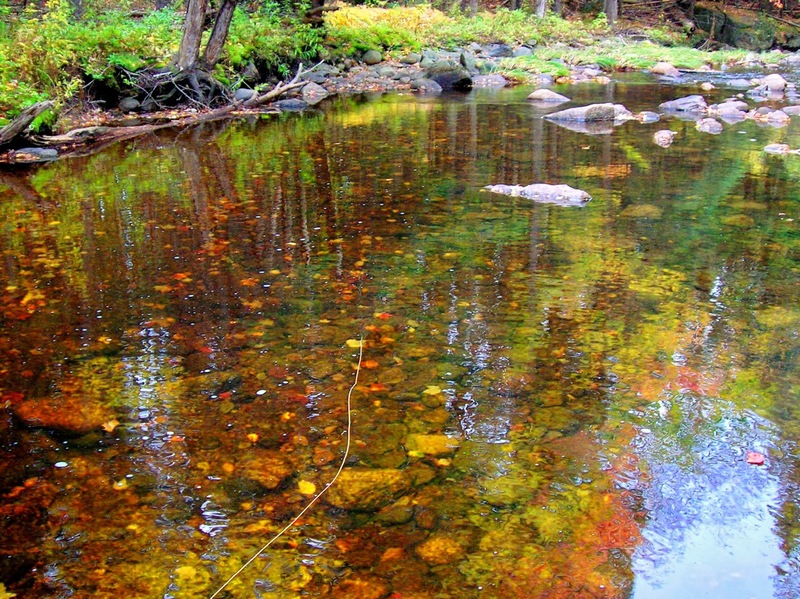 This area of the New England is starting to show color both in foliage and brook trout. Our outings in such places as pictured in this post will be delightful. So I'll be on and off the computer for the next day or so then it's off to the north woods. A new stream, and having to work. Thanks to the kindness of fellow angler and friend John, aka "Apache Trout" I was told of a stream that he had fished. It was a place of wild brookies, a place of beauty and solitude. Yesterday Kirk and I paid a visit to this piece of paradise. The sun had just started to break the surface as we arrived. The air was clear and cold. There had been a frost the night before and the flowers and grass at our feet were covered in an icy coating, looking like silver crystals as the light broke onto them. We geared up and made our way to the stream. We were told of a way to find the stream, but all that was needed was a good ear for the waters sound would direct you. The stream was in prime shape. It was made up of long and deep pools, with sections of fast riffles. It was in one of these deep pools that I was to get in a bit to far and paid the price of getting both boots filled with cold water. The sun as it broke through the trees gave a warming feel to the water soaked angler still trying to catch a fish. That fish was to come soon. A very small brookie took the fly in a little riffle. I worked upstream and fished many parts of the stream. I knew these were prime areas, but the hits never came. Kirk had went downstream and had fared better with his hookup rate. It was at the tail of this set of riffles that I had a good hit and hookup. It was here I brought the brookie to hand. Taking his photo I realized I didn't feel cold any more. There are days when they don't come easy. When you have to really work for that wild reward. Well worth the effort. While driving home the chills set into my body. I got home and went into the hot shower, an act I was to preform several times that afternoon. With the aid of some homemade chicken soup, and the healing rays of the sun I should be OK. Yesterday was one of those wonderful crisp mornings of early fall. I went downstairs opened the door and put my head out I could feel the chill. We have had a few chilly ones this month but this was by far the coolest. After some oatmeal and coffee I headed out for the stream. It was still dark as I drove, but one could see the sky starting to shed light. I arrived streamside and it was light enough to do what was needed to get ready for a few hours of angling. As I said it was a chilly morning, so chilly I had to wear my fleece jacket on top of the flannel shirt I had on. I made my way to the water and tossed out the fly. It was a Bomber, cause that's what was tied on from the previous outing. Working the pool I soon realized a fly change was needed. So I tied on a Picket Pin wet. I put several of these in my box the night before for they were what I had been tying for a future trip to Maine. Well it didn't take long on the third cast as the fly was just under the surface a swirl was seen but the fish missed it. A few casts later and the brookie was hooked. A cool crisp Autumn morning and a wild brook trout in hand. In a short but deep pool I sent the wet fly on a mission. It was a location that looked to be a good place for a brookie to hold. The strike came and the battle began. Several times I brought the fish close and several times he would have none of it. Finally I gained control and was able to put my hand in the water and lift the surprise fish up. It turned out to be a brown of somewhat generous size. I admired him and sent him on his way. As it turned out the Picket Pin was to be the only fly needed this day. It was a fine Autumn day. It seemed like summer made a brief comeback the last few days with the heat and humidity back in force. But Thursday night the summer heat was broken and nature put on a fireworks display. We received some heavy rains along with the winds they combined to drive the nasty weather out. After some necessary home duties I was able to get away about 9:30 and drive to a stream. The rains of the night before did little to raise the stream levels, but they were more than adequate for this time of year. I dropped the thermometer in the stream and it read 64. I felt that a dry fly would be the way to go this day. So the Bomber was chosen and put to work. The low clear water only managed to bring a few to the surface. The hits were fast and were missed. 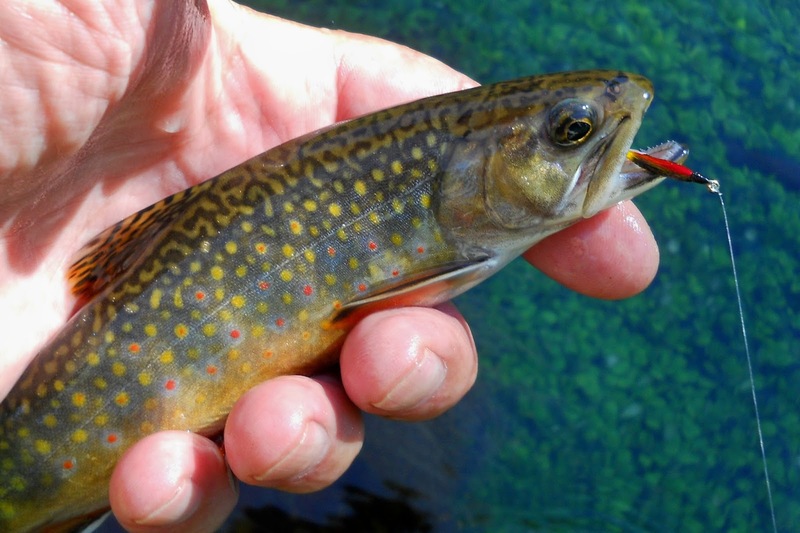 Wild brook trout to not like to be seen, and they don't comeback for a repeat strike. So I changed flies and went to a subsurface wet fly. I tied on a Picket Fin without a bead. With just that little difference of an inch or two underwater did the trick. The hookup rate picked up. The trout were holding near the banks at the end of the riffles. There was a definite feel of Autumn this day. There are those times when we are outdoors, be it in the woods, along a stream, perhaps walking a sandy shore, or just sitting out in the yard. Many times we notice objects some of which are beautiful some are not. In that moment it's seen and just as quick, it's forgotten. Here are a few images of such objects. This sea shell lays in the sand. It was a home to some creature, now broken it still has worth. The beauty it has as it rests with sand and stone along with bits of broken sea life are like stained glass art. The branch of a young pine tree. In its youth it reaches out to all of us, showing fresh enthusiasm. In the course of its life it will endure many hardships. Lets hope it survives. Plants growing in a tidal estuary. They sway with both tide and wind. They will become completely submerged when the tide is in and left high and dry as the tide moves out. There beauty can be enjoyed everyday of the year. This white feather, perhaps from a gull who needed it no more. It lies here at the mercy of the winds, but for the sea weed that extends its arm to hold it in reassurance. A flower growing along a stream. It casts its beauty. If and angler has a not so good of a day, this lovely creation in its own way will put a smile on his face. Yesterday morning around 5 Jeanette and I were packed and ready to pay a visit to one of our favorite places. Red Brook Massachusetts. 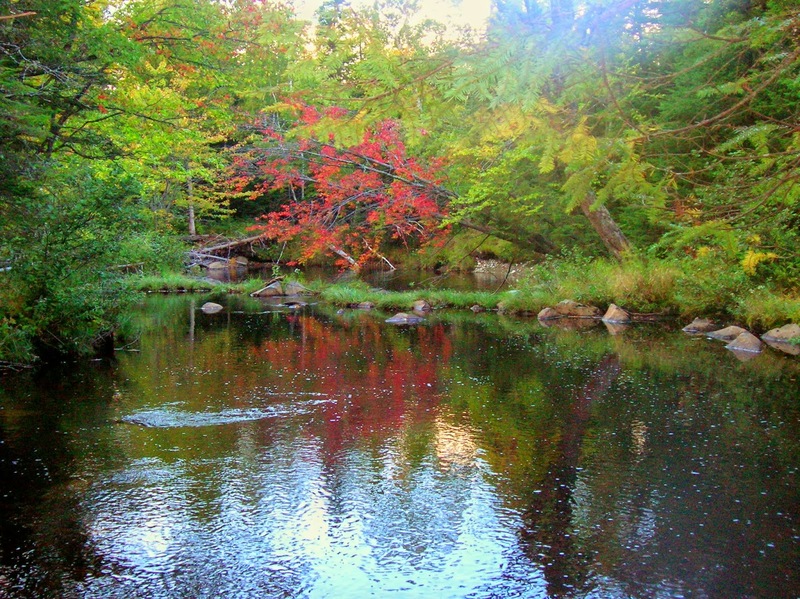 This wonderful stream is located at the gateway to Cape Cod. It's home to sea run brook trout "salters" as they are called. Eight AM found us in Buzzards Bay in the parking lot of Leo's breakfast emporium. Leo's is the place to dine for a great breakfast. After the meal we drove to Red Brook. Pulling into the parking area we were the only car there. I rigged up and soon we were walking through some of the most beautiful pine woods. The trail led us to the first area I will toss a streamer. This is where Red Brook turns into salt water. I have only taken a brook trout here once but it was a big one in the late fall one year. You still have to try it though for one never knows. Tidewater. There are times when you could take brook trout here as well as bluefish, stripers and perhaps flounder. Red Brook is an incredible habitat. You could spend days here and never fish yet still be rewarded. It is a tough place to fish. 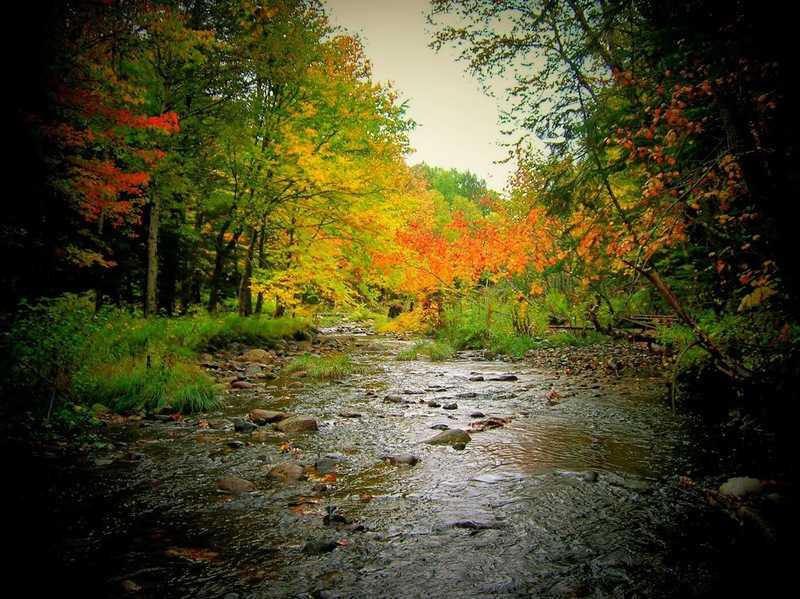 It's not your typical trout stream. It sort of meanders through thick brush and lots of in stream vegetation. Fly selection is also not typical. Dry flies, wets, and nymphs do not work well. Your best bet is to fish streamers. These brook trout feast on small fry from herring which spawn here in the spring. This little guy was sitting on some watercress. I imagine he would be on the "salters" menu also. This is a tough stream to fish. There are places where you could fish from the bank, but waders are a big plus. Years of restoration work have helped this stream flourish. There are dangers that must be watched for such as wood debris on the streams bottom. The first brook trout of the day. The fish took a Edson Tiger fished along the watercress. Even in bright sunshine and crystal water the brook trout have protection. They will slash your streamer form hiding places. This absolutely beautiful wild jewel took a gray soft hackle streamer. The afternoon found us at the place where Red Brook becomes Buttermilk Bay. This is pretty much salt. The brook trout can be found here but perhaps not at this time, the reason is there are to many predators. We walked the shore and I tossed the soft hackle streamer here and there. I received many responses from the snapper blues as well as a small striper who proceeded to swim out to sea with my fly. A snapper blue. Scrappy fighters, and there's a reason they call them snappers. This can be realized when you go to remove the fly. This day was completed in a restaurant in the town of Sandwich. A wonderful meal of Lobster Mac and Cheese, and Jeanette dined on a Rueben, with sweet potato fries. I'll return to Red Brook again in late October.